NTR Kathanayakudu movie release highlights: Here's what celebrities, critics and fans are saying about the Balakrishna starrer NTR Kathanayakudu. Will Balakrishna’s NTR: Mahanayakudu beat the odds and succeed at box office? NTR Kathanayakudu movie review: Vidya Balan makes her Tollywood debut with the Krish directorial. NTR: Kathanayakudu is based on one of the biggest cultural icons of the country, NT Rama Rao. After ruling the hearts of fans for several decades, he even dominated state politics in the undivided Andhra Pradesh. The biopic has been split into two parts: NTR: Kathanayakudu and NTR: Mahanayakudu. While the first part has hit the screens today, the second part will open in cinemas on February 7, this year. The film has a star-studded cast, including Balakrishna and Bollywood A-lister Vidya Balan. While Balakrishna has played his father NTR, Vidya has essayed the role of NTR’s wife Basavatarakam. Rana Daggubati, Nandamuri Kalyan Ram, Daggubati Raja and Bharath Reddy among others have played pivotal roles in the biopic. Radha Krishna Jagarlamudi aka Krish has helmed two-part biopic, which is co-produced by Balakrishna. Follow all the latest updates about Balakrishna's NTR Kathanayakudu. When you watch this film as a tribute to the legend of NTR, rather than his life’s story, it offers several moments that keep you interested in the narration. Especially, his contributions to cinema at a time, when advancement in filmmaking technology was decades away from reaching the shores of the country. "Classic NarrationStyle,Wonderful Direction by most talented @DirKrish Hats Off To the Film Team. It’s an emotional journey about our TFI Legendary Actor & Leader #Ntr . This film Respected the 2 Eyes of TFI. Congratulations to the NTR Team 💐 2 Thumbs Up 👍👍" He added in another tweet. NT Rama Rao is my brother. It is not an easy task to make a biopic on such a human being and actor. On top of it, his son Balakrishna trying to recreate the characters his father played is not at all easy. It is nothing less than a miracle to see Balayya playing NTR on-screen in such an extra-ordinary manner. When I saw some clippings of the film, I felt the legend has come back. This means his son Balayya in some angles does look like his father, which is a great thing. I pray to God that this film reaches zenith of success. The milestone mahanatudu #NTR biopic is hitting the screens tommorow. There can never be a greater biopic than this in Telugu Cinema. "#NTR, a name that needs no introduction to the Telugu people. His biopic is one kind of an honour for us and there can be no one like #NandamuriBalakrishna garu in the role. Like audience, even I'm eagerly waiting for the movie. All the best to @DirKrish garu and team," Sampath Nandi said via Twitter. “I never thought I would be playing my father on the big screen. When this idea was pitched to me, I realized it was my duty as a son to make this film. I launched my own production house and co-produced this movie,” Balakrishna said at a press meet of NTR: Kathanayakudu. Mahesh S Koneru posted on Twitter, "#NTRKathanayakudu - A faithful and honest portrayal of a Legend’s life . The climax has set up the story nicely for the second part. Loved it .. Waiting for #NTRMahanayakudu eagerly." While Dr Harish Goutham (@Harish_goutham) wrote on Twitter, "Decent first half with emotional scenes and detailed rise of NTR. Felt slow at times but overall liked the first half. Dialogus are plus point #NTRkathanayakudu," Sandeep Athreya (@SandeepSpeakz) tweeted, "#NTRKathanayakudu is a well-made and well-balanced film that Chronicles the life and times of N.T.R . #Balakrishna gets under the skin of NTR and carries the film on his shoulders. @vidya_balan is perfect cast for Basava Tarakam. She breathes life into the role. @DirKrish 👌👍🙏"
"#NTRKathanayakudu All the best @DirKrish #Balakrishna sir @vidya_balan and the entire team. .. ❤️ this film is all heart and a lot of hardwork has gone into recreating the life of a legend #Ntr sir .. plz watch it only in theatres," Rakul Preet said via Twitter. 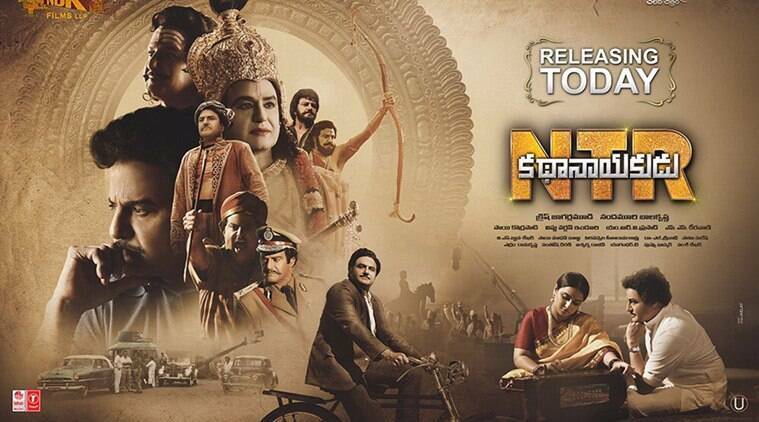 Film trade analyst Ramesh Bala tweeted, "#NBK garu has his Best #USA premieres with #NTRKathanayakudu. $440K till now.. It beats #GPSK 's $375 #USA premieres.."
“This is my first Telugu feature film and it is a bonanza for me. I signed up for one but it’s like getting to know you are going to have twins. This is not one but two films,” Vidya Balan said at a press meet of NTR: Kathanayakudu. Screenwriter Gopi Mohan shared on Twitter, "Best Wishes to #NBK @vidya_balan @iSumanth @RanaDaggubati, Captain @DirKrish @mmkeeravani garu & #NTRBiopic Team. Hearing good things about the film #NTRKathaNayakudu. Advance Wishes to @NBKFilms_ @Vibri @vishinduri & @VaaraahiCC @SaiKorrapati5 .💐💐💐"
Devi Sri Prasad wrote on Twitter, "Wishing all the very best to the whole team of #NTRKathanayakudu !! The BioPic of a Great Legend !! Cant wait to witness the magic of @DirKrish & #NandamuriBalakrishna garu 😊😊👍 and the fantastic Starcast !! Wishing U all a BLOCKBUSTER ! !😁🎹🎵"
“My father was my god and mentor. I grew up admiring him. And for long, I had the desire to play characters which he did. But, with time, the taste of people also change. I was concerned whether people would watch such movies if they were to be made today. But, NTR: Kathanayakudu and NTR: Mahanayakudu fulfilled my desire to play all the characters played by my father,” Balakrishna said at a press meet of NTR: Kathanayakudu.